For the first time in human history, there is food in abundance throughout the world. More people than ever before are now freed of the struggle for daily survival, yet few of us are aware of how food lands on our plates. Behind every meal you eat, there is a story. 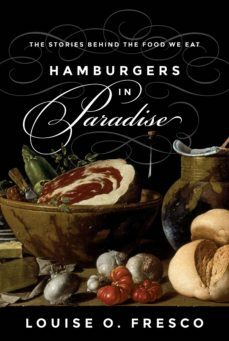 Hamburgers in Paradise explains how.In this wise and passionate book, Louise Fresco takes readers on an enticing cultural journey to show how science has enabled us to overcome past scarcities—and why we have every reason to be optimistic about the future. Using hamburgers in the Garden of Eden as a metaphor for the confusion surrounding food today, she looks at everything from the dominance of supermarkets and the decrease of biodiversity to organic foods and GMOs. She casts doubt on many popular claims about sustainability, and takes issue with naïve rejections of globalization and the idealization of "true and honest" food. Fresco explores topics such as agriculture in human history, poverty and development, and surplus and obesity. She provides insightful discussions of basic foods such as bread, fish, and meat, and intertwines them with social topics like slow food and other gastronomy movements, the fear of technology and risk, food and climate change, the agricultural landscape, urban food systems, and food in art.The culmination of decades of research, Hamburgers in Paradise provides valuable insights into how our food is produced, how it is consumed, and how we can use the lessons of the past to design food systems to feed all humankind in the future.